Crowdfund Queer Science Fiction, The Cones Of Dunshire And More! This week's look at all things Crowdfunding is a humdinger. We've got Lightspeed Magazine's all-queer-creator special, 80's clothing nostalgia, the mother of all Lord of the Rings/The Hobbit viewing parties, and yes: Parks and Recreation's absurdly complex (and totally awesome) board game. Let's check it out! Having already invited women to destroy science fiction, it was only fitting that LIGHTSPEED look for a new group of individuals who wanted to trade their feelings of marginalization for sledgehammers, and the "I Want to Destroy SF" inbox filled up all over again. People really wanted to break things in that most magnificent of ways: with prose. The Kickstarter has already reached its initial goal, but there are plenty of stretch goals planned, including boosts to the currently offered essays and subscriptions to the magazine, more LGBTQ-themed stories and plenty more - you can even read a sample from Lightspeed's latest issue here on io9. The earliest tier to offer a copy of the issue is $5 for the PDF, and $23 for a physical copy, while other rewards include subscriptions and previous Lightspeed specials. As we get ready for the release for the final film in the Hobbit Trilogy, we couldn't let Peter Jackson's Middle-earth movies sail into the West without one final, big celebration! So we're planning to hold a Party of Special Magnificence next February — a final toast to all SIX movies, both The Lord of the Rings trilogy and The Hobbit trilogy. Pledges are still open and feature a variety of rewards, from T-shirts to buttons, but if you want in on actually attending the party, the earliest tier that grants you everything - dinner, goody bags, tickets to the screenings, free drinks - is $200. $100 nets you access to the screenings at the party, but no Dinner (hobbits need not apply for this option). $45 nets you a copy of the expansion when it releases - or if you want to get into the full game, there's a $105 pledge tier that gets you both the base game and the expansion. Remember the 80's? I'll make several of you feel slightly more ancient by saying hell no for me, I'm only 23. But regardless of being around for the decade or otherwise, I recognise the coolness (perhaps literal coolness) of these old-school gloves that have designs that react to external temperatures. Now they're back for nostalgic adults! After years of searching for Freezy Freakies as (sort of) adults, we realized two things: 1) they've been out of production for a while, and 2) they were never even made in adult sizes. The other glove brands that have survived since the '80s all seem to have matured in their styles, regardless of the fact that many of us did not. Totally uncool, right? Well the solution became clear: we had to bring back Freezy Freakies in their original '80s designs, adding some more modern materials for comfort, and in adult sizes for the first time ever. A $29 pledge gets you one pair of the four new designs being made. That unicorn-pegasus (Unisus? Pegacorn?) one is pretty damn rad guys. In August of 2012, we raised $100k here on Kickstarter. With that funding, we interviewed over 54 of professionals in the space industry and completed filming, research, and editing for this film. Now in 2015 we need your help to get it out to the masses as soon as possible. FIGHT FOR SPACE is a feature length documentary film that explores the economic and cultural benefits of human space exploration, and examines the historical and political events that have led to the decline of human space exploration. FIGHT FOR SPACE presents viewpoints from Astronauts, politicians and staff, scientists, former NASA officials, commercial space entrepreneurs, and many other individuals in the space community. A $25 pledge offers a HD download of the final documentary when it's due for release in May. This is expensive, but this is a one-time opportunity to own a legendary game in an edition that people will talk about and desire for years. Nothing else will bring The Architect's vision to life, as this game will! Become a part of history–be one of the proud owners of the Deluxe Edition of The Cones of Dunshire! In recreating the version of the game from the show, the pledge to get an actual copy of the game is a whopping $500 (with some bonus swag including a replica copy of the script for the episode The Cones of Dunshire), while lower tiers allow you to support the project and get Cones themed merchandise. Initial plans previously mentioned that a more affordable, downsized version of the game would be released to the public later down the line, but there's no mention of that in this kickstarter. 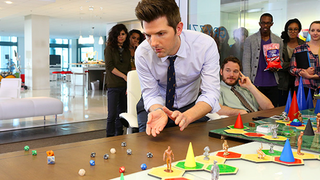 If you're a crazy diehard Parks and Rec fan, this is for you.